What will grow from this acorn? For a few years now, I have had the feeling that sections of the MR industry are desperate to find something to do with the internet. The problem is, the internet is not the cheap source of self-completion data that some to hope is. With UK access for only around 20% of the population, there are very obvious problems of sampling. Almost all the research that is taking place on the internet is about the internet: about the sites visited, banner advertising, e-commerce and so on. Rex Briggs at internet research specialists Millward Brown Interactive has spent several years measuring activity on web sites in ever more sophisticated ways. The launch of MBI's new 'Brand Impact' service takes this to the next stage by combining site logging data with more conventional respondent survey data from a pop-up questionnaire. "We know we can measure when people look at a site, where they go, how long they spend there. From this you could analyse the data on a daily basis. That kind of information is like knowing how many people walked into your store and what aisles they browsed. But the problem is it does not tell you what is going on in the mind of the consumer or whether they intend to buy from you." Triggered by the event of seeing certain stimulus information when visiting a site, Brand Impact will pop up with a questionnaire to a small sample of visitors as they are about to leave the site. This gathers the valuable attitudinal and intentional information that can be linked to the behavioural data obtained from website tracking. It gives you the kind of information you get from artificial environments created to monitor ad or packaging effectiveness, like a simulated supermarket shelf with concealed eye-reaction detectors. But, as Briggs points out, "This isn't a simulation. We are observing in the real world. We've tested banners, sponsorship, even advertising over the cursor." Compared with traditional brand research, where a $70,000 spend per brand is not uncommon, Briggs claims it can deliver comparable results for a tenth of the cost or less. Briggs directed me to a secret location on the web where it is testing its newest product. This aims to make market research much more accessible to the general MR community by allowing clients to commission and design surveys through a web page. "This is not robot research", he pointed out. "We tie it together with a human being, who can see everything you are doing." A researcher is assigned to each project, and can contact the client to give advice or suggest improvements. Registered clients sign into the site and are then prompted for all the information needed to tailor a standard questionnaire to their needs. When the service is operating, the questionnaire and your test ad will then be sent to one of the participating high-profile websites. The figures are impressive: an average ad impression runs to 1.3 million, with a random sample of around 4,000 of them getting the questionnaire. Typical response rates are 20% and sometimes higher. A complete sample can be achieved in 24 hours. What also impressed me was the ease by which I was able to create a questionnaire for a real, self-completion survey using no more than a web browser and an incomplete knowledge of the market. Surely there is mileage in this technology for the more conventional research methodologies too. Bravely, AC Neilsen have taken a more traditional, but internet-savvy approach when offering "e-Panel" as one of their BASES services. Creating a panel is smart idea as you can control the demographics to achieve a balanced sample. At present the web panel only operates in the United States, where internet use in the home is much higher than it is this side of the Atlantic. It also overcomes several other obstacles with the internet. Some still look askance at the commercial use of the internet, and even go as far as to switch off graphics in their web browsers so they do not have to look at banner advertising. The expectation of the internet is to receive much for free, and for the givers to expect no more than a 'hit' on their website counter in return. Researchers need to tread carefully. 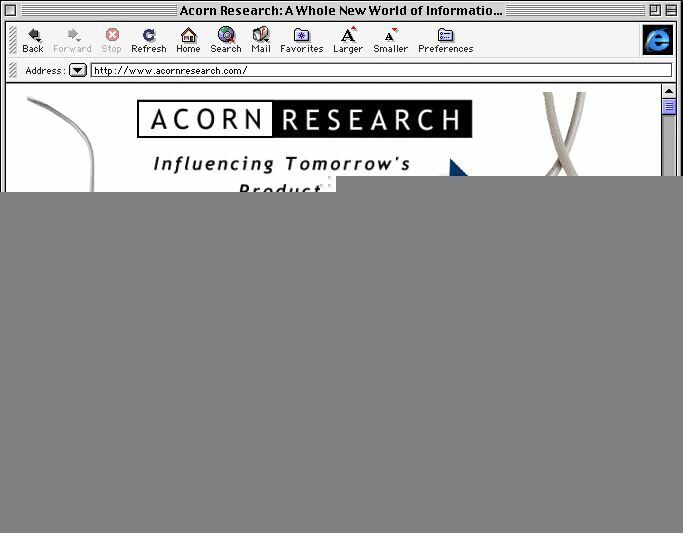 Neilsen carefully packages its survey vehicle on the web as Acorn Research, with its homespun name, membership, a club-like atmosphere and rewards offered for participation. It is surely no oversight that there is not a single mention of ownership by Neilsen - presumably for fear of showing the hand of mammon to sensitive netizens. According to the BASES web site, e-panel is offered as a more cost-effective equivalent to other collection methods such as mall intercepts for general consumer work, not just internet-based offerings. It will be interesting to see how long we have to wait before Neilsen judge that internet usage has reached the point where representative samples can be achieved in the UK or Europe. At this year's MRS Conference, Peter Hayes spoke of the "pernicious, debilitating effect" of interview length on the willingness of potential respondents to participate. For face-to-face and telephone, he urged researchers to keep within thirty minutes. This problem will be compounded if the same approach is applied to the web. Internet respondents will simply move onto something else if they lose interest in your survey; a thirty-minute interview is likely to left unfinished after the first three. But the beauty of the net, as MBI's Rex Briggs has found, is that you don't need to ask as much if you are also measuring what they are doing as well. The real opportunity of the internet is to make it quicker, cheaper and easier to do research. Published in Research, the magazine of the Market Research Society, May 1999, Issue 396.